I am excited to announce that you no longer have to remember the "@blogspot.com" extension to get here. I am now official with SouthernAsBiscuits.com! Well, it feels kind of official anyway. Speaking of blogging, it gets kind of lonely out here in cyberspace. Unlike Facebook, folks are not as willing to leave comments, so it often feels like I'm talking to myself, leaving me wondering if any given post was well-received or not, or even read at all. To help with this, I've added a comment check box, so to speak, where y'all can just click "funny", "interesting" or simply "cool". So please, feel free to comment, make suggestions on future posts, or just say "hi". 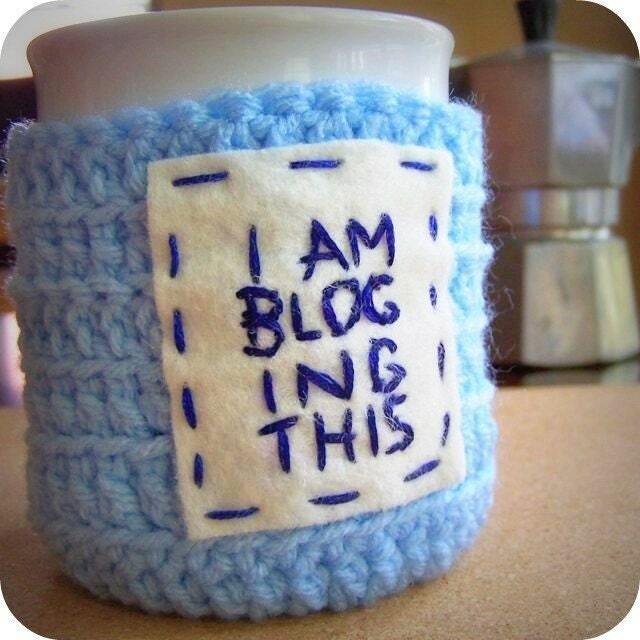 What an awesome gift this would make for your favorite Blogger(s)! [ahem]. This local knitter from Apex, NC has oodles of hilarious & crude cozies. (click the photo to go to her Etsy shop). So mark your commuter mug! No more drinking the other teacher's bobo brand coffee by accident. I like the "quick" comment idea. I read often, but don't often have time to comment. And, I know the feeling... I post some things to FB expenting to see lots of comments, specifically when I post a poem or something longer than a status update. And, when I log on, I literally hear crickets! Oh well. Keep writing even if you have a slow day. Your writing is as much for you as it is the rest of us!